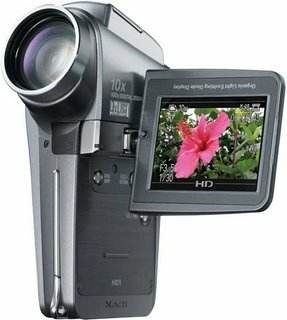 Russ Fischer has reviewed this camcorder from Sanyo, the Xacti HD1. Sanyo's Xacti HD1 camcorder was designed to capture high-definition MPEG-4 video and 5.1-megapixel stills. It packs in a 10X optical zoom, image stabilization, and noise reduction—all in a lightweight package for less than $800. If the resulting video weren't laced with compression artifacts, we'd be head over heels.